Teach viola with the popular Suzuki Viola School. The Suzuki Method of Talent Education is based on Shinichi Suzuki's view that every child is born with ability, and that people are the product of their environment. According to Shinichi Suzuki, a world-renowned violinist and teacher, the greatest joy an adult can know comes from developing a child's potential so he/she can express all that is harmonious and best in human beings. Students are taught using the "mother-tongue" approach. 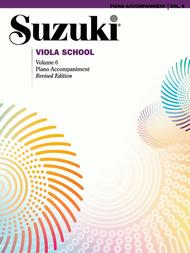 Each series of books for a particular instrument in the Suzuki Method is considered a Suzuki music school, such as the Suzuki Viola School. Suzuki lessons are generally given in a private studio setting with additional group lessons. The student listens to the recordings and works with their Suzuki viola teacher to develop their potential as a musician and as a person. 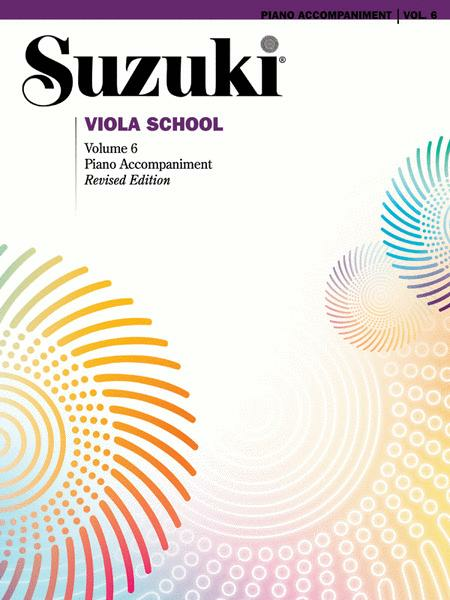 This Suzuki piano accompaniment book for Volume 6 aids in Suzuki viola lessons. Titles: Tonalization and Intonation Exercises (Suzuki) * Exercises in Octaves and Sixths (Preucil) * La Folia (Marais/arr. Preucil) * Allegro (Fiocco) * Suite in G Major from Suite in G Major for Violoncello, BWV 1007 (Allemande, Minuet I, Minuet II) (Bach) * Arioso, Sinfonia for Oboe, Violin, Viola, Basso Continuo, Ich Steh mit einen Fuss im Grabe, BWV 156 (Bach) * Chromatic Scale Exercises (Preucil) * Three-Octave Scales and Arpeggios in D Major and D Minor (Preucil) * Adagio and Rondo in D (Adagio, Rondo) (Mozart) * Hungarian Dance No. 5 (Brahms) * Position Etudes (Suzuki) * Country Dances (Beethoven) * Concerto for Two Violins, Violin II Arranged for Viola, BWV 1043 (1st Movement: Vivace) (Bach) * Concerto in C Minor (I. Allegro molto ma maestoso, II. Adagio molto espressivo) (Bach/arr. Casadesus).